Carequality, a public-private collaborative working as part of the Sequoia Project (formerly known as Healtheway) to drive more efficient data exchange, has launched an interoperability framework it says will be useful to a diverse array stakeholders. 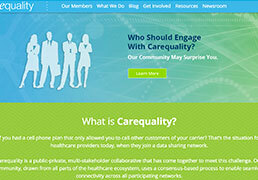 "The beauty of the Framework is that it's general; it can be applied to any type of content and any technical architecture," said Dave Cassel, director of Carequality, in a press statement, describing a set of elements, including legal terms, policy requirements, technical specifications and governance processes, meant to set the stage for better data sharing. Organizations participating in Carequality - from AMA to ZOLL - agree to support common standards and specs, enabling a secure and interoperable connection among them. The new framework is available for health information exchange networks, vendors and payers alike, offering what Carequality says is a "practical approach" to enabling more widespread connectivity. "We're starting with document queries because those capabilities are widely supported in the field, but that's obviously not the last word in interoperability," said Cassel. "The framework provides the governance and trust foundation required for any type of widespread connectivity in healthcare." Organizations adopting the Carequality Interoperability Framework can establish data sharing partnerships quickly and uniformly, making better use of existing networks and business relationships, according to the group. For example, physician practices that are already members of an HIE, or connect through a vendor or service provider, can leverage the framework to let those existing operations to access one another, expanding the scope of data liquidity. As the organization puts it on its website: "What if you had a cell phone plan that only allowed you to call other customers of your carrier?" "We need secure health information exchange, where a patient's story travels with them, to provide safe, efficient, engaged, high quality healthcare," Matthew Eisenberg, medical informatics director of analytics and innovation at Stanford Health Care and co-chair of the Carequality Advisory Council, said in a statement. "This can no longer be accomplished in just one health system, one region or even one network, it must be available everywhere." The initial data sharing under the Carequality Interoperability Framework is led by 12 organizations. While the first chapter focuses on query-based exchange of clinical documents, the aim is eventually support "an unlimited variety" of uses. "We know that interoperability is critical to coordinated care which improves patient experience and patient outcomes," said Michael Hodgkins, MD, chief medical information officer of the American Medical Association and chair of the Carequality Steering Committee, in a press statement. "The development and adoption of the Carequality Interoperability Framework is key to enabling coordinated care for patients nationwide."